Enjoy a regal feel in your bedroom with the Tyrone comforter set from Silver Orchid. 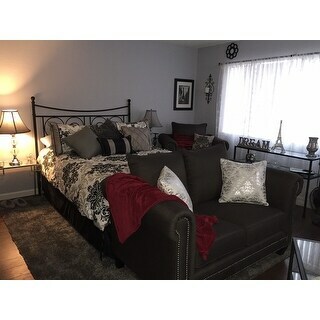 Featuring an ornate flocked damask pattern in black and grey against a white background, this 7-piece set creates a comprehensive look while offering ultimate comfort. An Elegant and Affordable Bedding Solution, this comforter set has high style at low cost. It features the very popular damask print style in an almost 3D pattern which is very eye catching. It is bright and warm and will offer anyone a luxurious and comfortable sleep. I looked for a long time for the perfect comforter set and definitely found it! Have a black king size bed with brushed silver accent rings and this comforter was just made for it. The decorator pillows add the elegant touch! I'm thinking of adding a splash of red - another accent pillow! Good quality and fits neatly inside my sideboards of the bed. No need for the bed skirt - may make a window accessory out of it. Great price too! Would recommend it if they wanted a "look" more than a particular feel. The flocking on the comforter is nice but the over-all fabric felt cheap to me. BUT I know I tend to be picky. I recently updated my bedroom in grays with white and black accents. This comforter set is GORGEOUS! I absolutely love it! A perfect color pallet with a soft and subtle feel to the entire 7-piece Comforter Set. Lovely Comforter i got it in the king size very warm fit me well for those cold day &amp; night up north New York, i have no complaints i spend less than $150 for this comforter why would i have anything to complain about the quality! With that price what would i expect! I have shopped in high ends stores here in New York and 1 like this 7 pieces can rund you *** near $500 dollars so paying haft of that it a steal. it also fit my French Damask design / shabby chic glam decor My bathroom kitchen and bedrooms tie in so beautifully! I only wish overstock have more collection in the Damask design. I have it in the black gray/ silvee & white colors. Everything I hoped it'd be! This comforter is plush and very comfortable! I was surprised to find that the black damask patterns were velvet, which made me like if even more! I love that it came with three decorative pillows, they're a nice touch! I got new bedroom furniture and purchased the king set to finish the look. I was surprised by the quality. It's higher quality then other comforters I have ever had. It's very warm also. I was surprised the black designs are actually a raised velour material. Nice surprise. Machine washable is also a bonus. I would buy another comforter from this same dealer. Can't wait to get into bed at night! This is a beautiful comforter and quality material for such a great low price! I bought this as a gift for my daughter as she redecorated her room. She washed it, partially dried, then hung to complete drying..no problems. It looks nice on the bed and has a good weight. I was absolutely thrilled when I opened the box and saw what I had ordered. The comforter is beautiful, as are the pillows. I would recommend this product to anyone and everyone. I am thoroughly enjoying it. It is so elegant. 1st things first... it arrived on time and packaged neatly in a square zip up bag. No horrible odor, folded perfectly with all items. This is much softer than what i had anticipated given some other reviews. The black deco is a velveteen almost, and however its on there, seems legit. The blanket itself is just how i had hoped, not too thick, stuffing seems proportionate and the underneath is soft. I purchased the King and am very pleased. The ONLY reason i have given 4 stars instead of 5 is that the pillows are spot clean only. Ive got a very square memory foam bed and this lays over it nicely and felt quite adult (im 36) as i stared at it from afar. Wouldnt say "luxurious" exactly, then again, what does that even mean. For the price... this is a must have. Im simply in love. Will edit review once i run it through the wash cycle. Also i have cats and so far seems unaffected by their claws. Plus. Looked great when we received this item - until I attempted to wash it according to the manufacturer directions. Flocked areas all came off leaving a mess in the washer and all over the comforter. Ended up having to throw it out - so disappointed! Never had any issues with a purchase from Overstock until now and I've been a customer over 5 years. Love this set. Beautiful and quality is good. So pretty. Exactly what’s on the picture. I love the way it’s so comfy and it isn’t flat like most comforters. I love the colors it has, black and white. Loved everything about it! Exactly as pictured. Nice quality for the price. Love! Great quality and looks amazing! I can even wash it in my washer and holds up perfect! It looks very elegant in our chic farmhouse style home but still has that classy look. Still looks new even after several months of us and washing it. This comforter is one of the best ones I've ever purchased. I would recommend it to anyone, especially if you have a white or tan back board. Looks very fancy. Just like anyone else, when buying something online, I’m constantly looking at every website out there to find a great deal. I personally am going on two years (winter) using this beautiful comforter... Honestly, the quality feels like I could of bought this at a very high end store. Would definitely buy this again!!!!!! Love. Love. Love. Rich feel, regal look. Great comforter set. Soft, not scratchy. My daughter loved the design and look of this set. Perfect for the step up from tween to teen room! "Is it possible to get this in twin size? " Currently a twin size is not available. "is the comforter cover or comforter"
"Does it fade after washing?" I've washed it about 4 times and it's ok so far. The black is like a velvet material so it didn't fade. Mine hasn't faded at all. It's very good material. I did not have issues with fading. I did not dry in the dryer but over a line. It is still in excellent shape after 4 months. It fits our needs for finding a set that is both masculine and feminine. "This comes in only cal king. I need a queen. When will this one be available?" Hello plainsviewmom61, items are restocked as they become available; however we cannot guarantee an item will be restocked. Thank you for shopping with us. "I know this is a polyester comforter, but... Does this comforter have a "shiny" satin sheen, or is it more "flat" dull fabric? I am trying to stay away from anything too shiny. There is no mention of this in any of the reviews"
Hello maryleejam, From what the reviews state this is more of a dull fabric nothing silk to it. I hope this information helped you. Thanks for shopping with us! "Will this be available in Queen size? It's gorgeous"